Four bedrooms with adjoining baths make this property a good fit for up to four couples, but it also welcomes families with older children to come and enjoy the many amenities offered. Included on the list are a large private pool, outdoor barbeque, hot tub, satellite television, internet access, and, of course, views of St. Jean Beach. A five-minute drive will deliver guests to the popular Gouverneur Beach for sun, sand, and swimming, but there is no need to leave if they choose not to. A fully-equipped kitchen and grill ensure that food preparation is a breeze and the daily maid service will take care of the house. Nomade Villa offers a hillside setting and views of the sea over St. Jean, Saline Bay and the northeast side of the island. 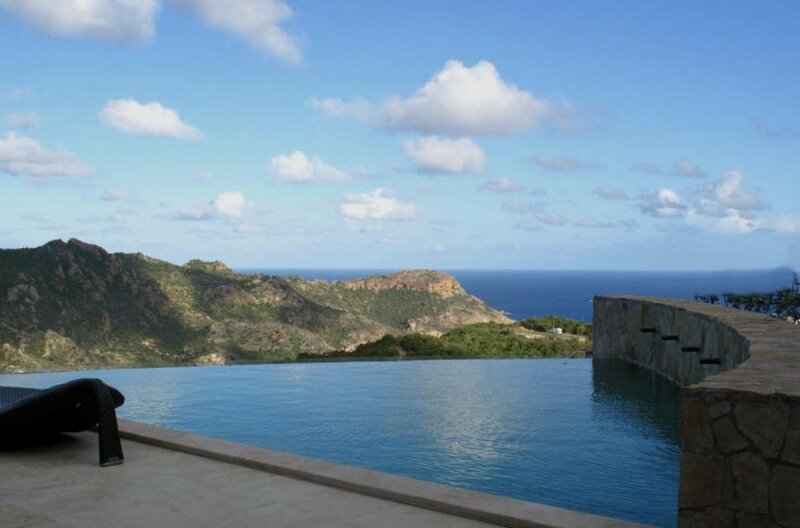 This villa provides many amenities and a high degree of privacy. A contemporary style is set off by the choice in furnishings, which is just one of the many reasons that this villa is meant for a peaceful vacation amidst beauty. Ocean view (St. Jean bay), air-conditioning, ceiling fan, large king-size four-poster bed with mosquito net, mosquito screens, telephone, WI-FI, and safe. Private covered deck overlooking St. Jean, with a living area. En-suite bathroom with dressing room, shower, large polished concrete wash basin with 2 taps, hair dryer, bathrobes, towels and beach towels, La Ligne de St Barth welcome products. Hillside and ocean view, air-conditioning, ceiling fan, large king-size bed, mosquito screens, telephone, high speed internet connection with cable, iPod dock, mini-bar, espresso machine, television with DVD player, and safe. Private deck with 2 lounge chairs and a table for 2, direct access to parking and to the pool. En-suite bathroom with ocean view shower, 2 wash basins, hair dryer, bathrobes, towels and beach towels, La Ligne de St Barth welcome products. Ocean view (Saline), air-conditioning, ceiling fan, queen-size four-poster bed with mosquito net, mosquito screens, telephone, high speed internet connection with cable, and safe. En-suite bathroom with ocean view shower, hair dryer, bathrobes, towels and beach towels, La Ligne de St Barth welcome product. Ocean view (Saline), air-conditioning, ceiling fan, queen-size four-poster bed with mosquito net, mosquito screens, telephone, high speed internet connection with cable, and safe. En-suite bathroom with shower opening onto the back Zen garden, hair dryer, bathrobes, towels and beach towels, La Ligne de St Barth welcome product. Both bedroom 3 & 4 open onto the deck where the heated Jacuzzi is located. Different places are located throughout the villa and the various decks, perfect for the ones searching for a quiet place to relax. The main living area is situated on the middle level, in the Great Room, with a sofa, library with a wide choice of books in French, English, and Italian, large flat-screen television with Dish Network, telephone and fax, surround-sound system (in the Great Room, terrace and pool area), and an iPod dock. The Great Room opens onto a covered deck, partially closed by glass walls, offering a view over St. Jean bay, Saline, and the island. An ideal place for a cocktail, another living area is also available by the pool. Inside dining in the Great Room with a rectangular wood and stone table for 8 guests. A breakfast area has been set up in the back Zen garden with a teak table for 4. Nomade Villa has a fully equipped ocean view kitchen (Saline view) with a La Canche gas stove and oven, fridge and freezer, ice maker, microwave, dishwasher, toaster, coffee and espresso machine, blender, wine cave, electric whisk, mini mixer. Gas BBQ in the back garden. Service for 18. Gouverneur Beach is the closest beach to the villa. About a 5 minute drive.